I have another source for you to consider when looking for a cheap plus size wedding dress. Igigi.com have gowns that fit a plus size bride and her budget! "These gowns are absolutely gorgeous and so affordable." As you will see below their buyers certainly have an eye for what looks good on a plus size woman. "You can use the gowns for formal or informal wedding dresses. It is also nice to see wedding gowns on plus size models. This makes it easy to get some idea of how a gown possible will look on you." Which gown should you choose for your body shape? So if you are looking for cheap plus size wedding dresses, I know you are wondering... "What is the price range of the dresses below?" The items below range between $185 to $350 dollars. Great prices don't you think! Apple or Diamond shape: Christelle, Madelaine Chiffon, Enchanted Wedding styles will hide the midriff area and focus the attention on the bust and face. Pear or Inverted Triangle Shape: Christelle, Eveline Pleated, Enchanted Wedding style will balance your figure. Curvy or Hourglass Shape: "Angeline lace" dress will show off your figure. Rectangle Shape: Eveline Pleat is a good choice. Igigis has 2 shrug styles that will go with most styles below if you want something to cover your arms. Note: If you are looking for a cheap plus size wedding gowns, click on this link IGIGIS Plus Size Wedding Collection for more details. The dresses below are designed and made here in the USA. Available for immediate delivery. Sizes 12 - 32. Fast Delivery. Good Return Policy. Do you need help picking your perfect dress? Learn how to pick the gown that is right for you! Find out which gown styles work for different body shapes. Check out this shop of plus size cheap wedding gowns from a mix of top designers. 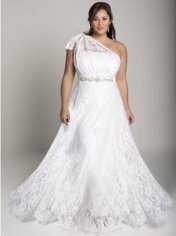 Cheap Plus Size Wedding Gown Styles.